January 9th 1974: Delivered to Societé Nationale des Chemins de Fer Français, Paris, France. 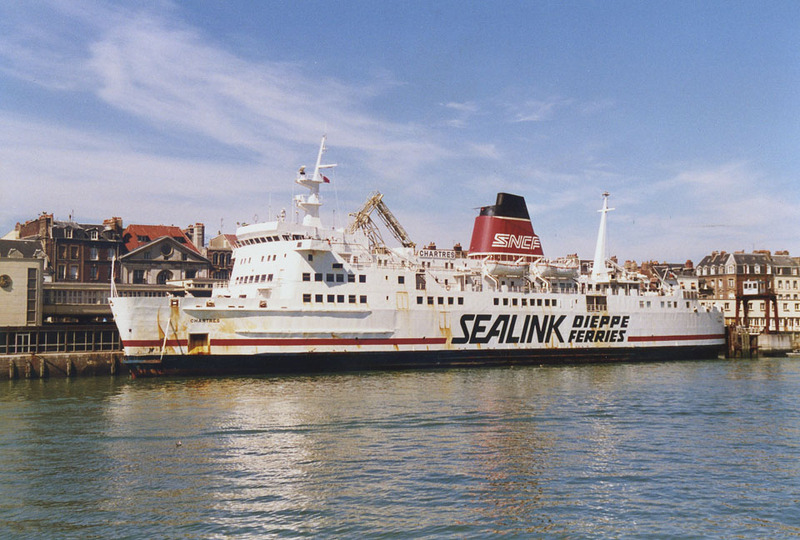 (Home port Calais). 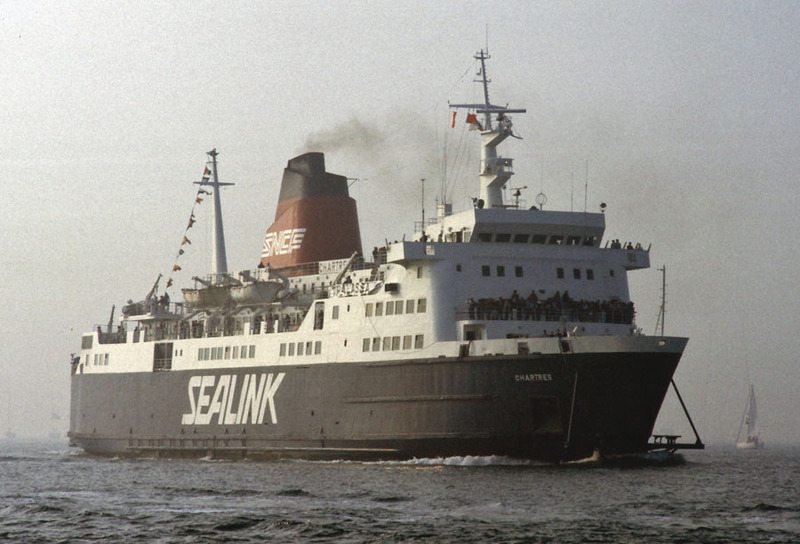 February 15th/16th 1974: Berthing trials at Boulogne, Calais and Dunkerque. 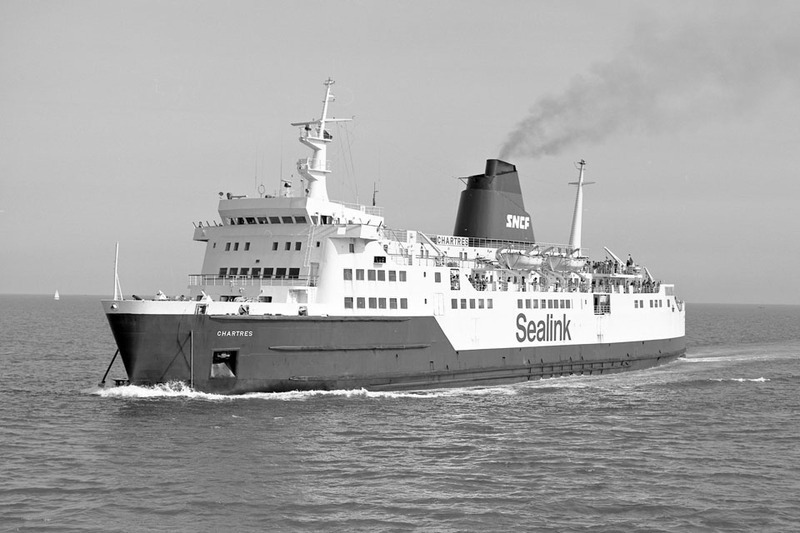 February 25th 1974: Installed as a freight ferry between Dover – Dunkerque. 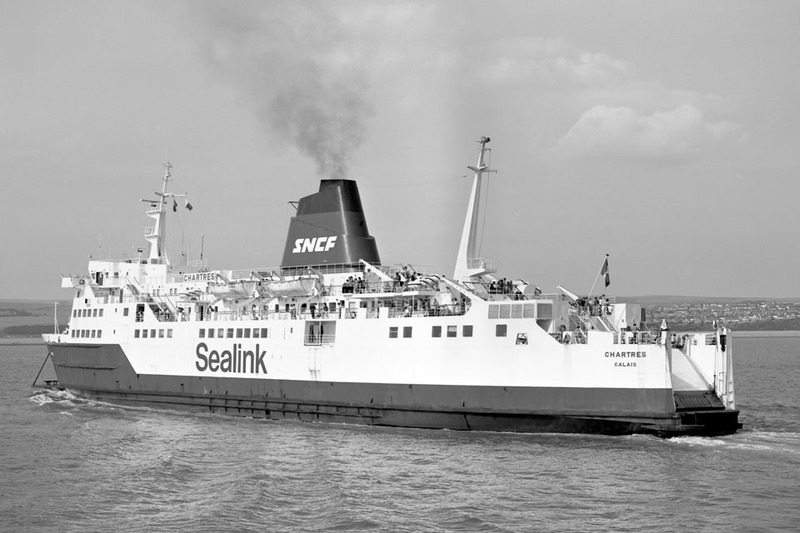 March 1st 1974: First commercial sailing to Calais she carried British Rugby supporters travelling to Paris for a game in the Five Nations tournament. 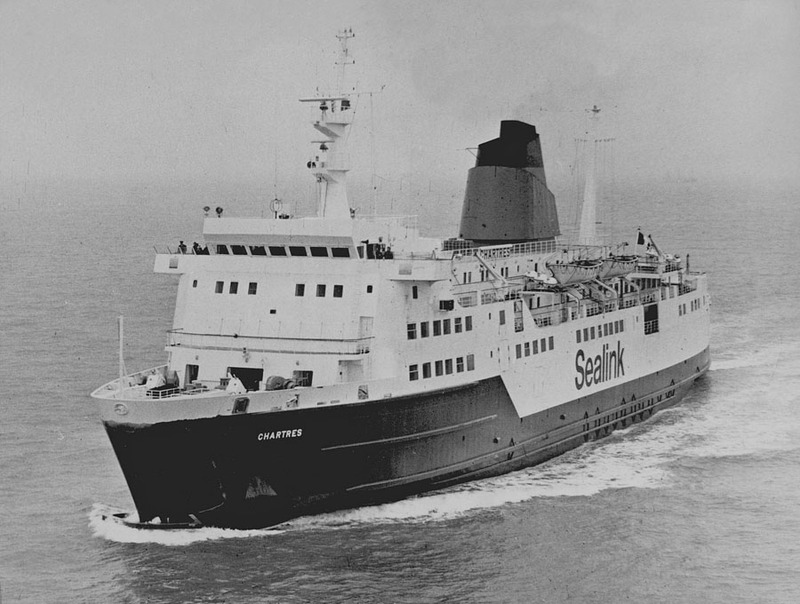 March 6th 1974: Christened in Calais. 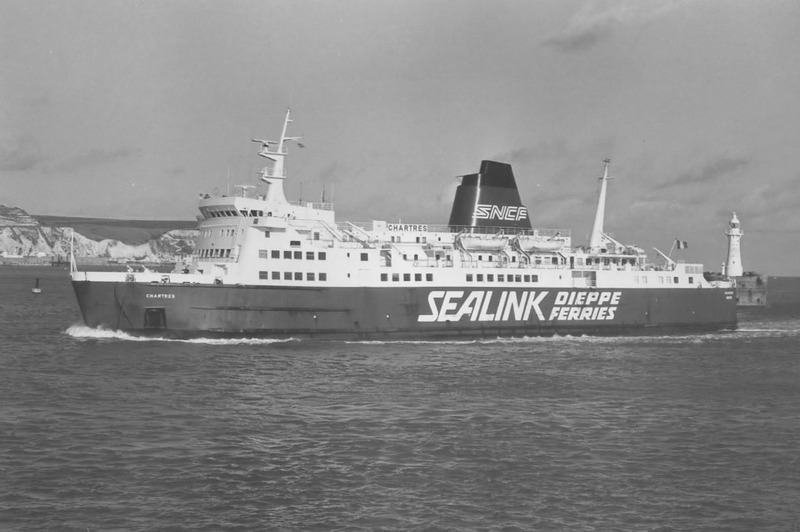 May 28th 1974: Commenced service as a passenger ferry during the summer, operating between Calais/Boulogne – Dover. 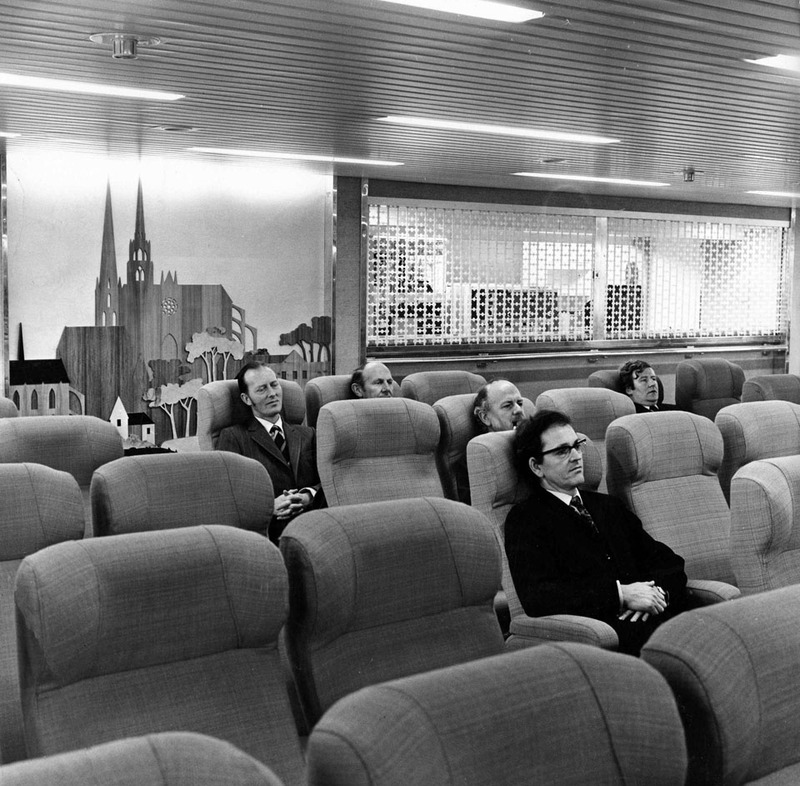 In the winter acting as a train ferry between Dunkerque – Dover. 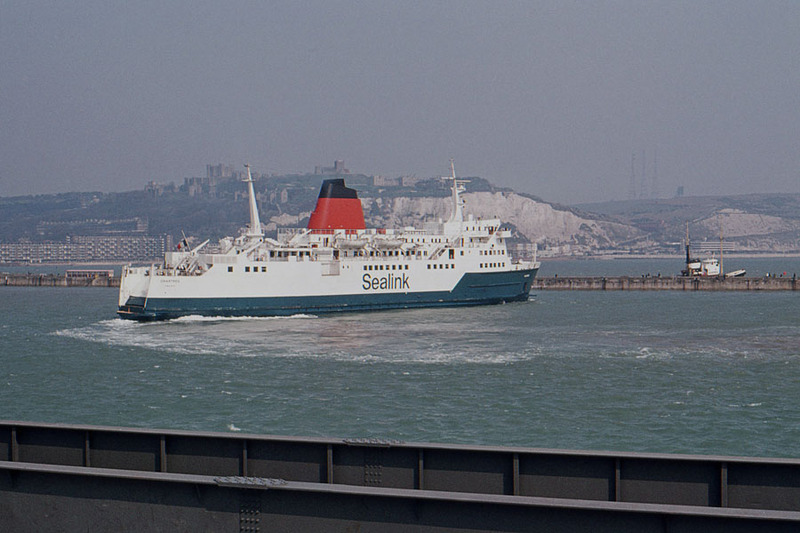 January 16th 1975 – February 22nd 1975: Operated between Dieppe – Newhaven, then Calais – Dover. 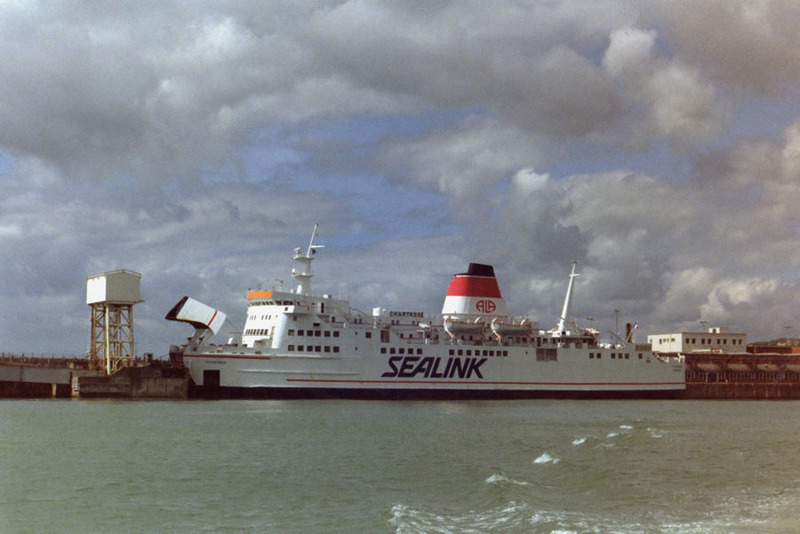 Also operated Folkestone Boulogne. 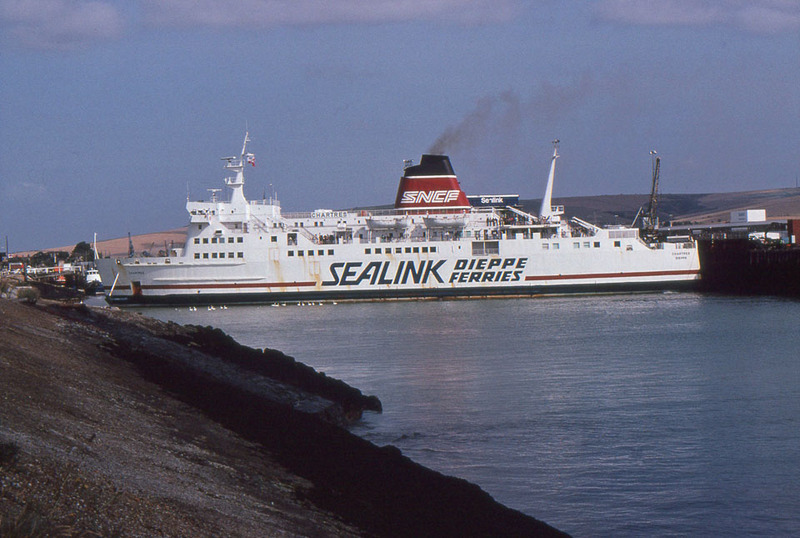 November 28th 1975 – January 19th 1976: Operated between Dieppe – Newhaven. 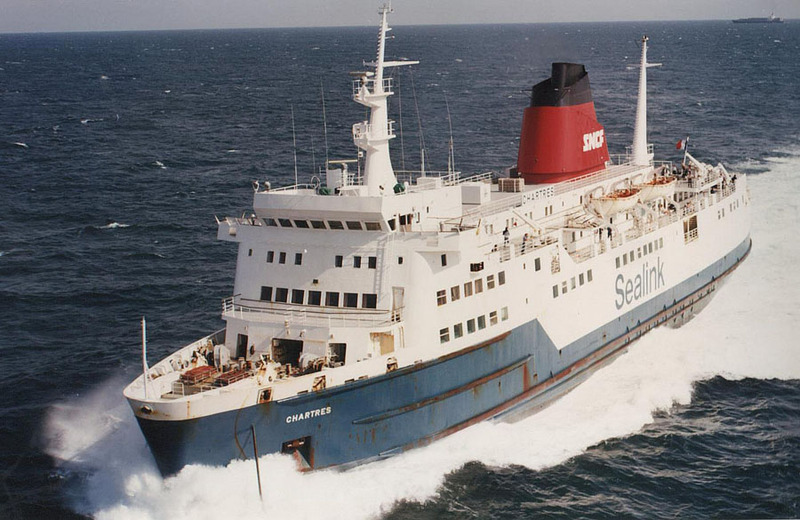 1978: Collided with the pilot vessel LOUIS MAGNIEZ in Calais. 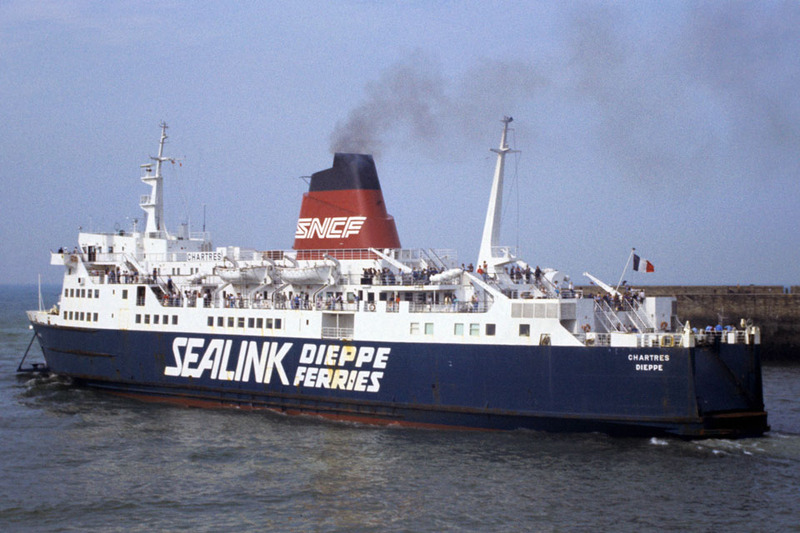 1981: Planned to take over route Dunkerque West – Dover to replace SAINT GERMAIN. 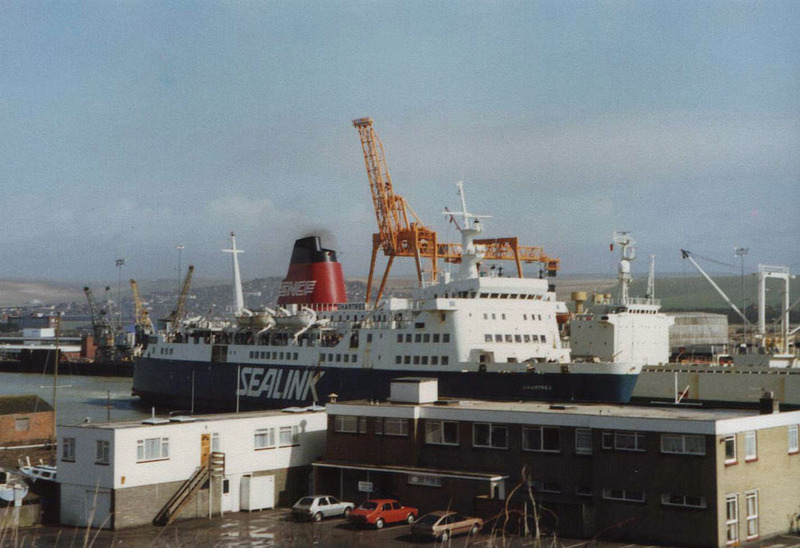 May 1981: Damaged herself in her home port and retired to the local dry dock. 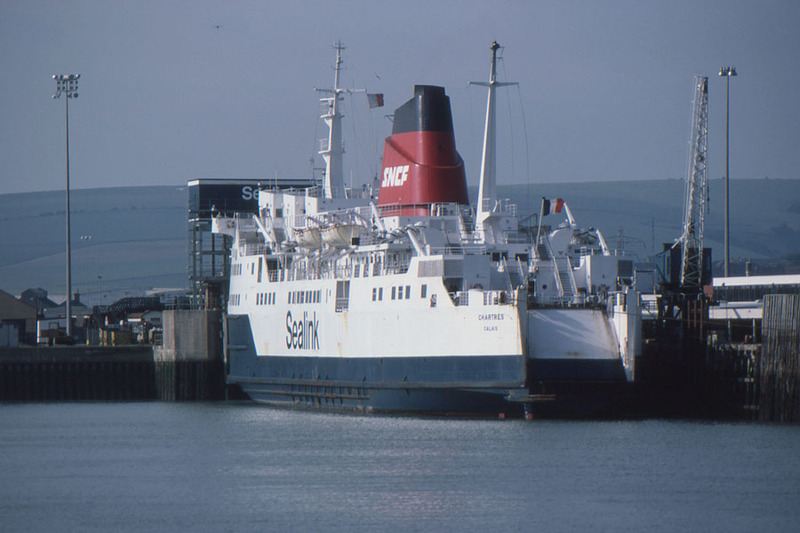 June 12th 1981: Substituted on Dunkerque – Dover route for SAINT-GERMAIN which went off service with engine troubles, then returned to Dover – Calais. 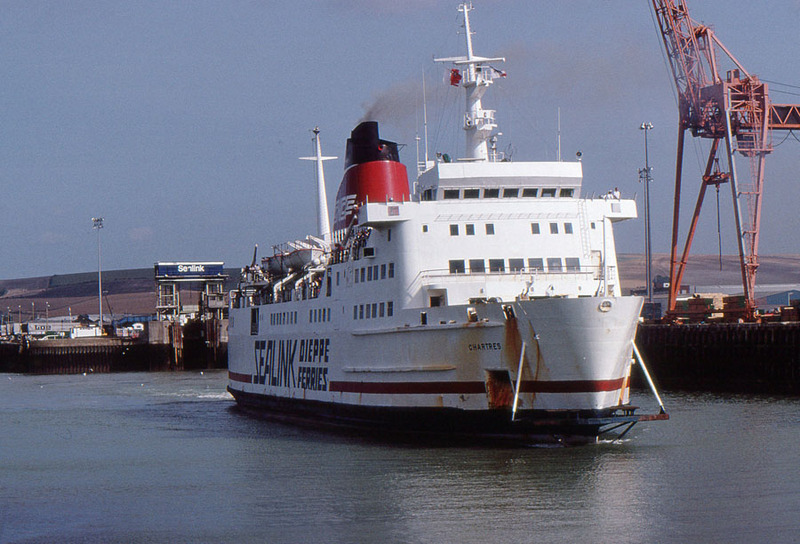 May 29th 1982: Operated between Dieppe – Newhaven. 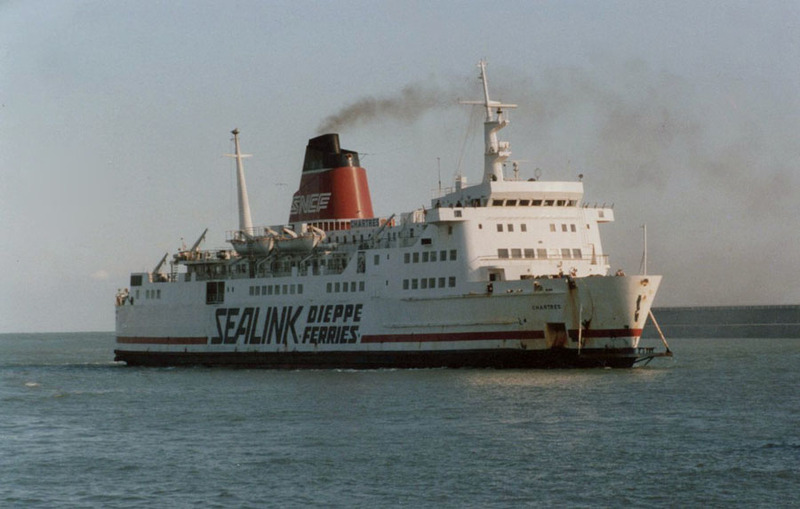 May 17th 1986: Charter cruise Dieppe/up the River Seine. 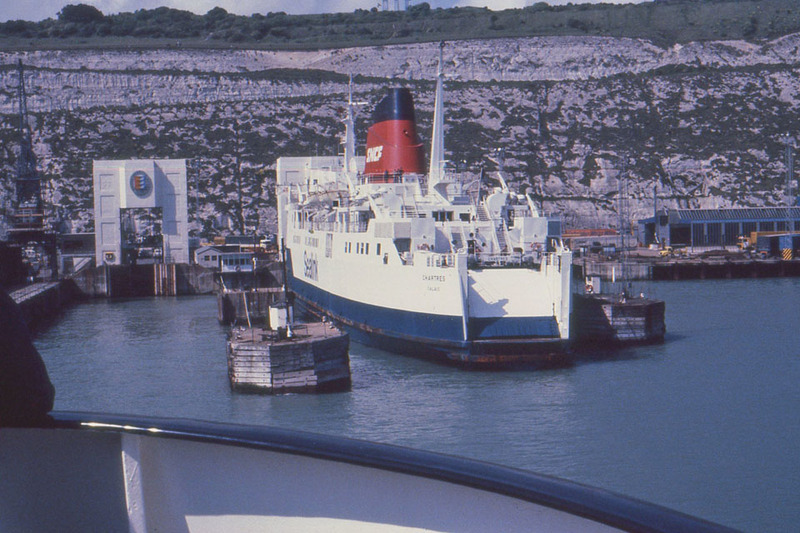 June 7th 1986: Charter cruise Dieppe/up the River Seine. 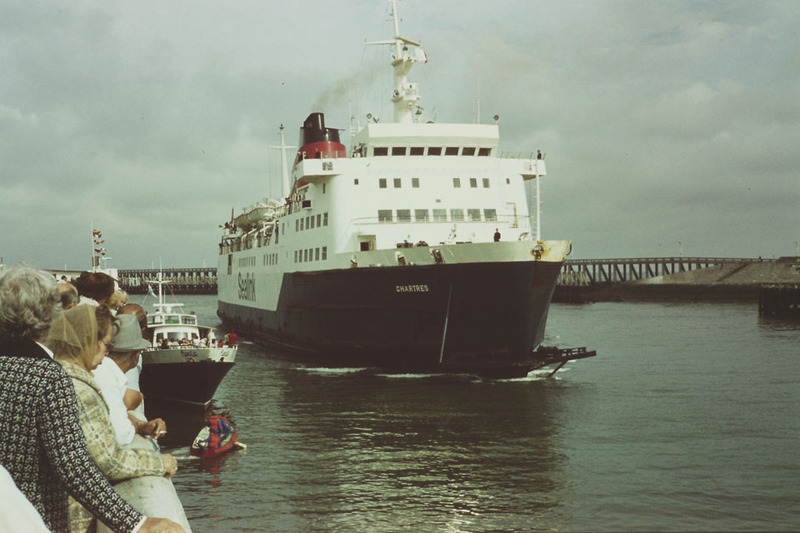 1986 (Spring): Charter cruise acting as a grandstand, to watch the Round the World Yacht Race. 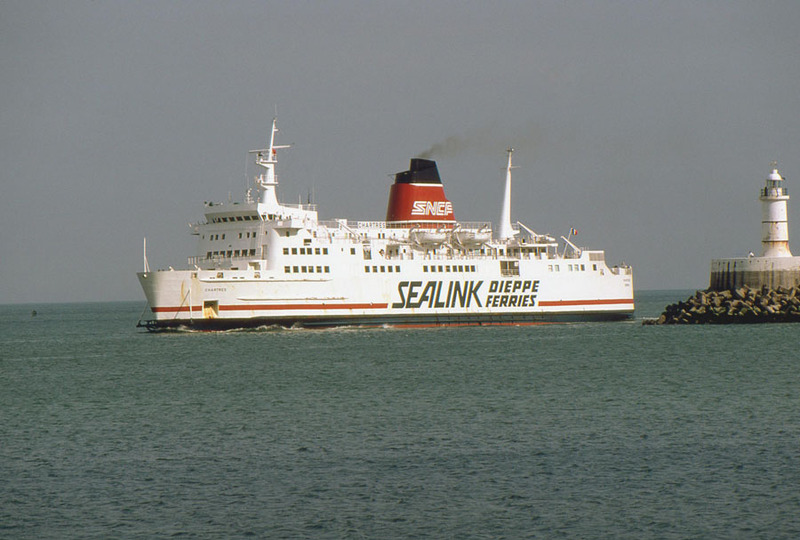 October 1986 – November 1986: Substituted as a train ferry between Dunkerque West – Dover, before returning to Dieppe. 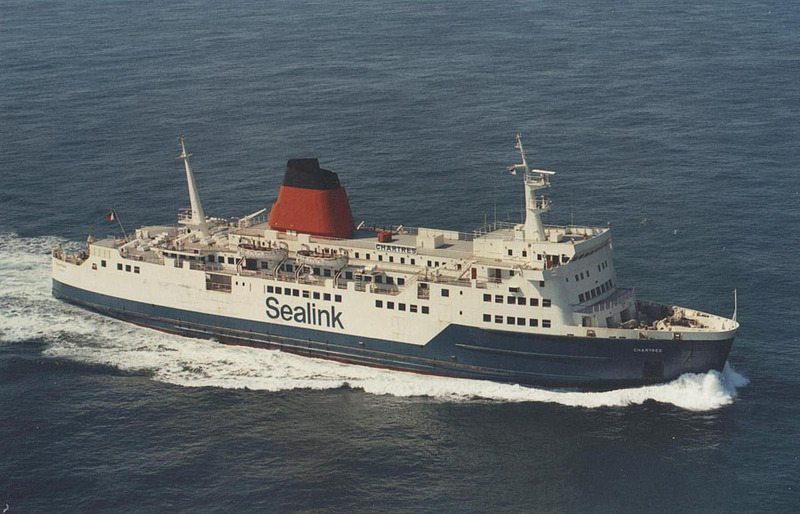 September 1988 – October 13th 1988: Operated between Dover – Dunkerque. 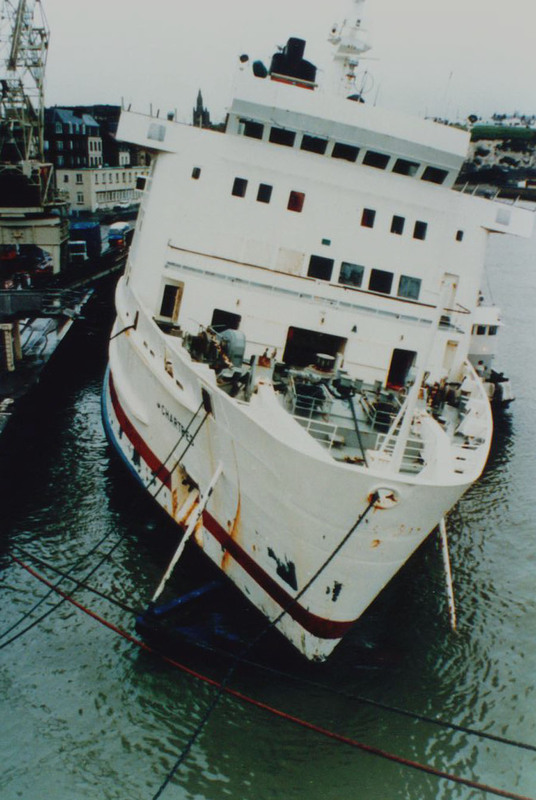 “Chartres had sailed with 80 passengers and 50 crew, with the weather forecast predicting winds in the Channel of gale force 8, gusting to storm force 10. However, by the time she was around 27 miles out from Newhaven, they had increased to hurricane force 11/12. 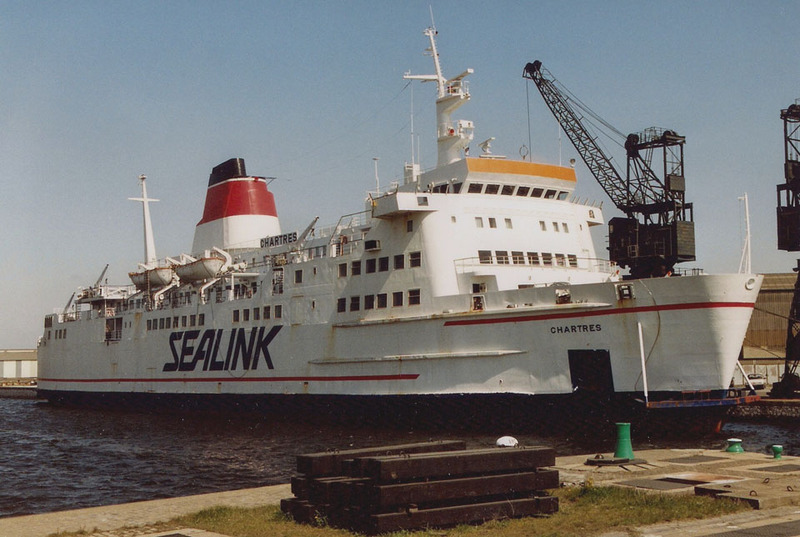 The massive resulting waves of up to 70 feet, described by passenger Andrew Allfree as being ‘like mountains’, smashed through the windows of her bridge. This resulted in a total electrical failure and, shortly after, both her main engines came to a stop. 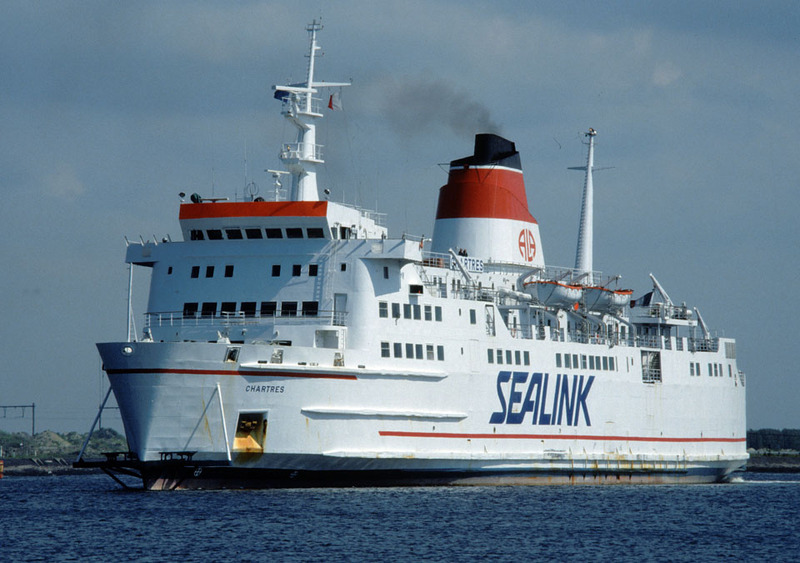 She was now adrift at the mercy of the weather and you can imagine what must have been going through the minds of passengers and crew alike. 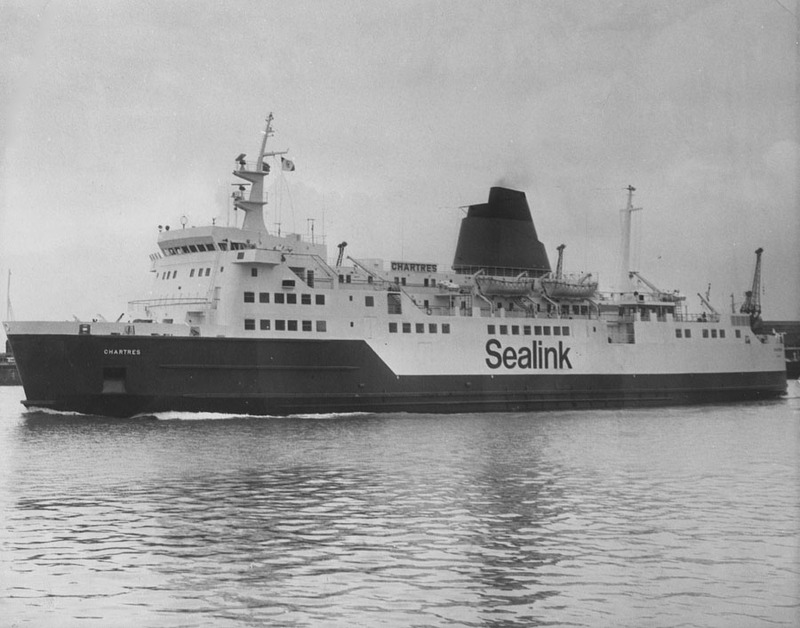 More forward-facing windows were then smashed and reports from the passengers on board at the time say that ‘there was water everywhere and furniture was flying around’. 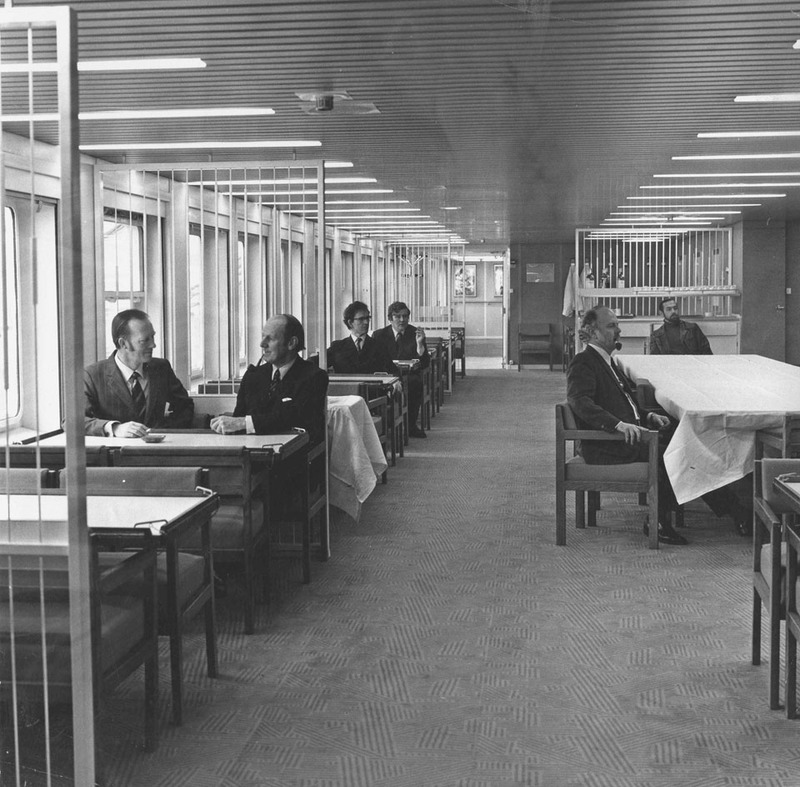 The crew swiftly moved all passengers to the comparative safety of the aft cafeteria, which was located on a lower deck, and issued them all with lifejackets. 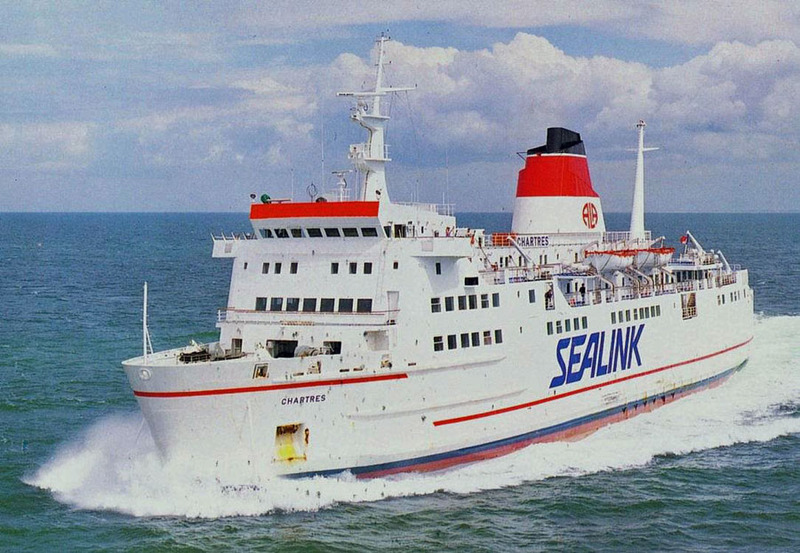 The ship’s Master, Captain Yves Lerouvrer, sent out a mayday call, and Newhaven Lifeboat and a Coastguard helicopter were launched from the UK. In addition, a French navy frigate and a cargo ship were diverted towards her. However, it was decided that the weather was so bad that our tug Meeching would not be allowed to go to her aid, a journey that would in any case have taken many hours. 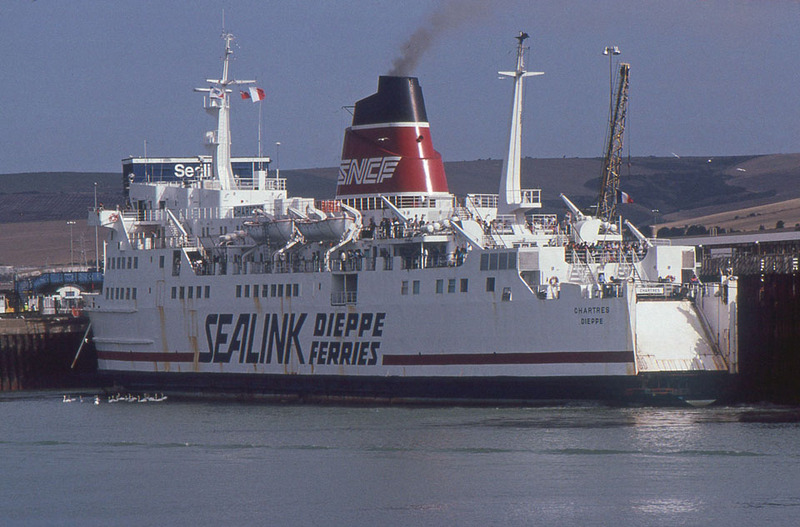 After Chartres had been drifting for around three quarters of an hour, her main engines were restarted and she was able to resume her journey to Dieppe. 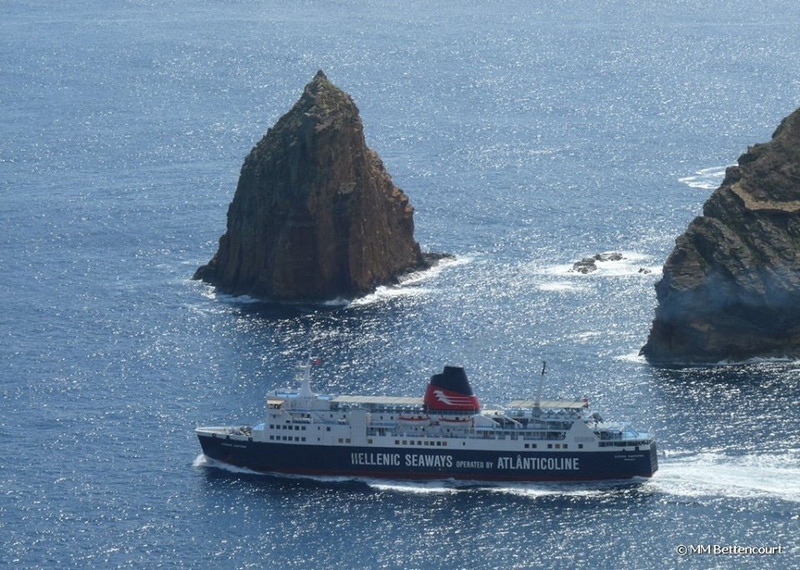 The passengers must have been breathing a collective sigh of relief as she approached the French port, but nature had another cruel trick to play. 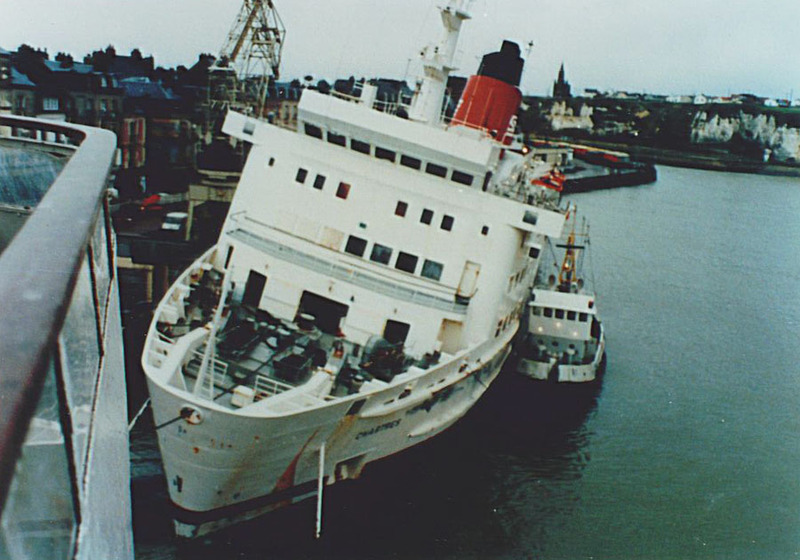 Entering the harbour, she was twice dashed against the pier, resulting in a huge gash below the waterline on her port side some 150 feet long. 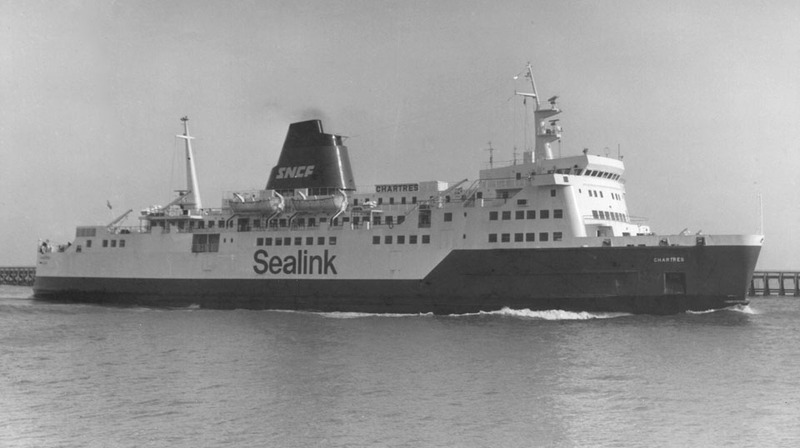 Water rushed in and, given previous car ferry disasters such as the Wahine and the Herald of Free Enterprise, it was very nearly a case of ‘so near yet so far’. 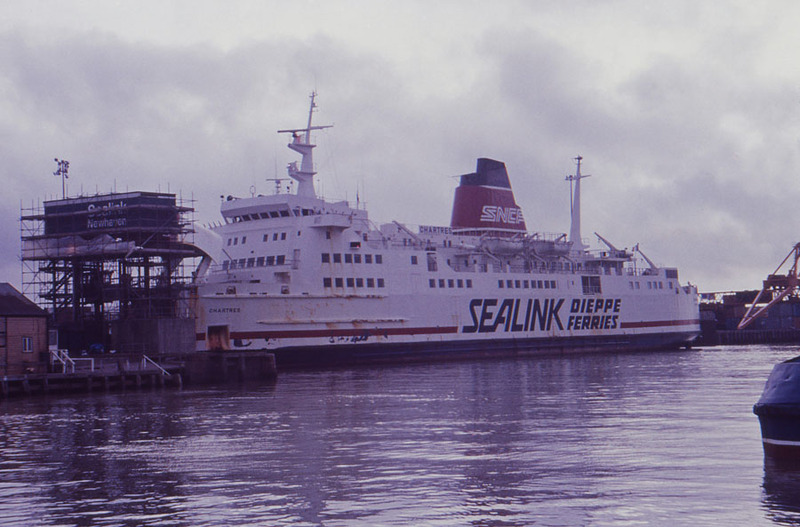 However, the seamanship skills of Captain Lerouvrer and his crew, plus the swift assistance of Dieppe’s tugs, meant that Chartres was just able to make it alongside the Quai Henri IV. 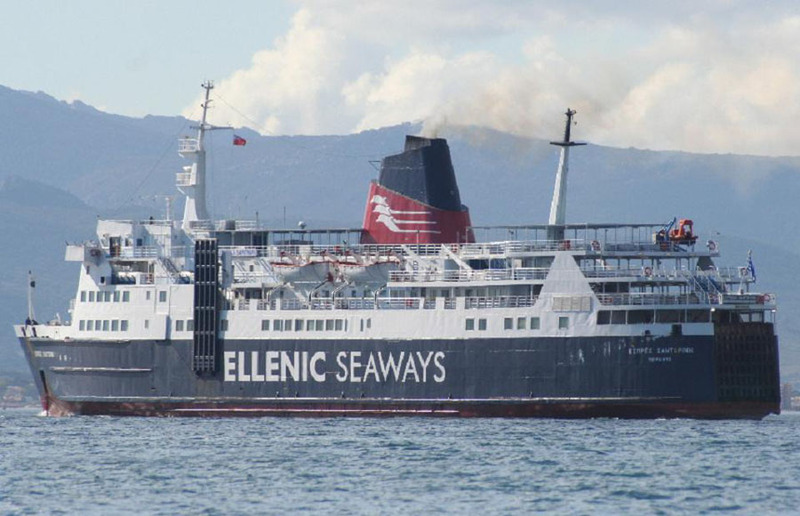 Passengers were disembarked immediately with those injured passengers and crew members being stretchered ashore. Most were put up in a Dieppe hotel, before being able to continue their journeys, but it would be some time before cars and lorries would be unloaded. 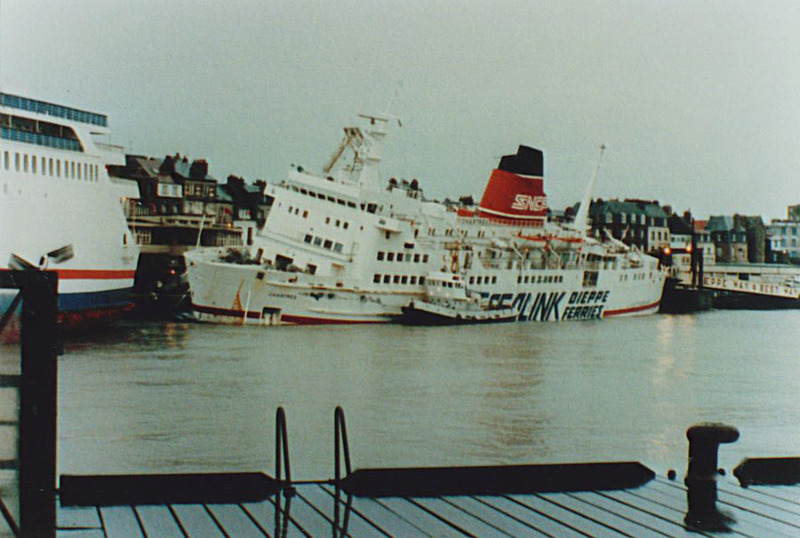 The three photos show Chartres moored at the main ramp in Dieppe, low in the water and with a heavy list to port. 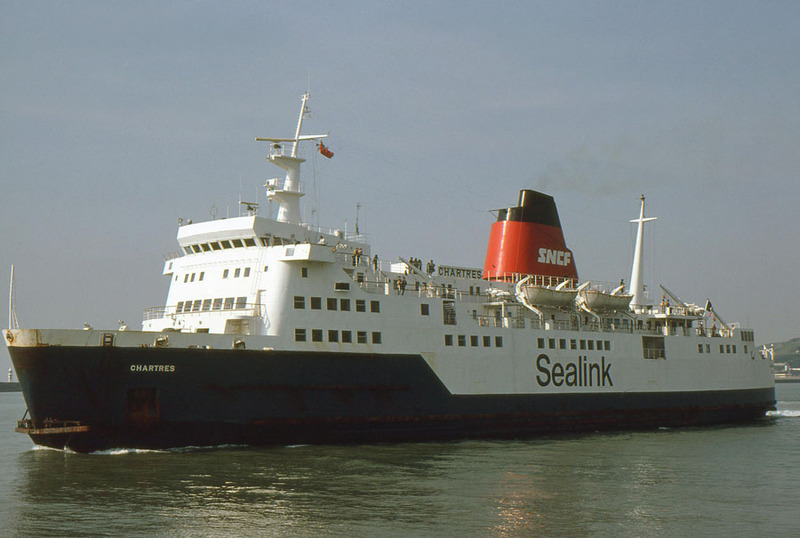 Given the weather conditions and the near disaster, there was much criticism of the decision to sail, and it was pointed out that Chartres had been involved in a similar incident in January 1983. On that occasion too her bridge windows had been smashed and all engine power lost for a time. 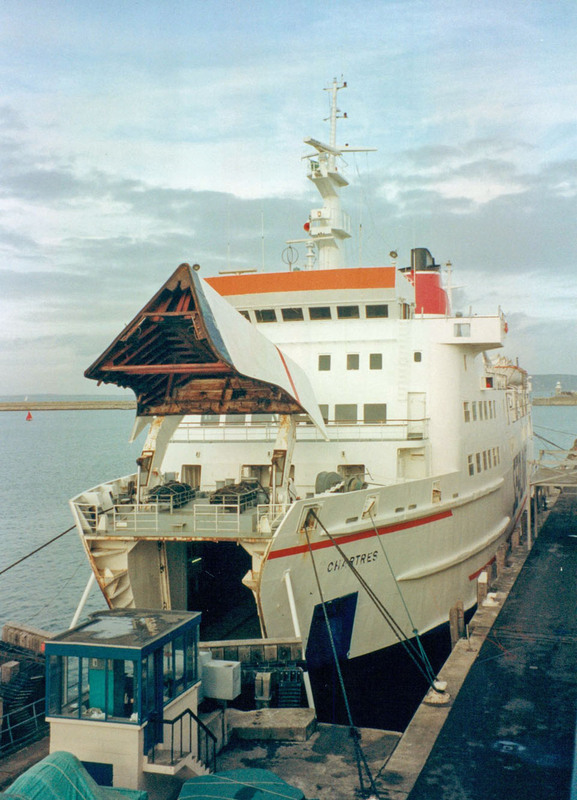 Much damage was done on the car deck, where several lorries broke their lashings and overturned. 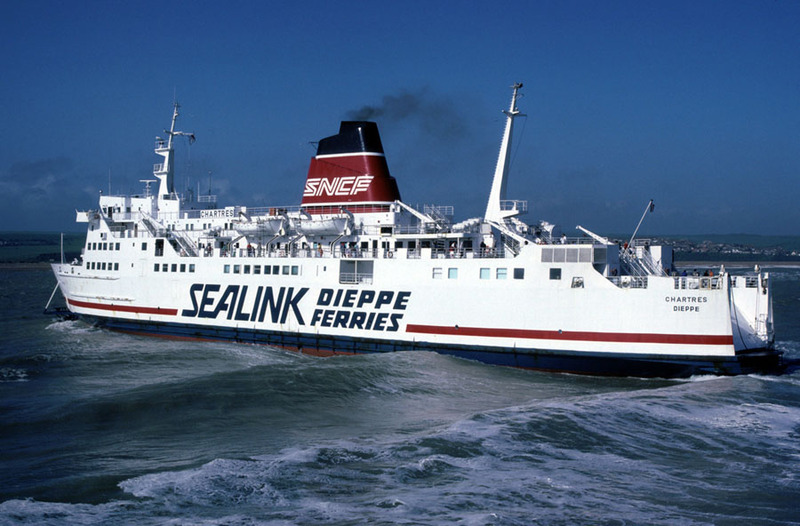 However, Dieppe Ferries were quick to point out that Captain Lerouvrer’s decision was based on the most up to date weather forecast available to him at the time and insisted that ‘no pressure was put on him to sail’. 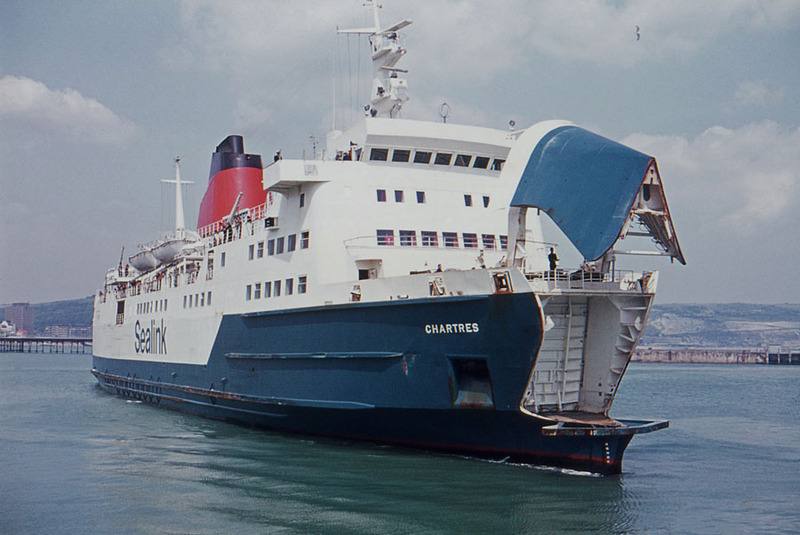 June 3rd 1990: After repair installed between Calais – Dover Western Dock. 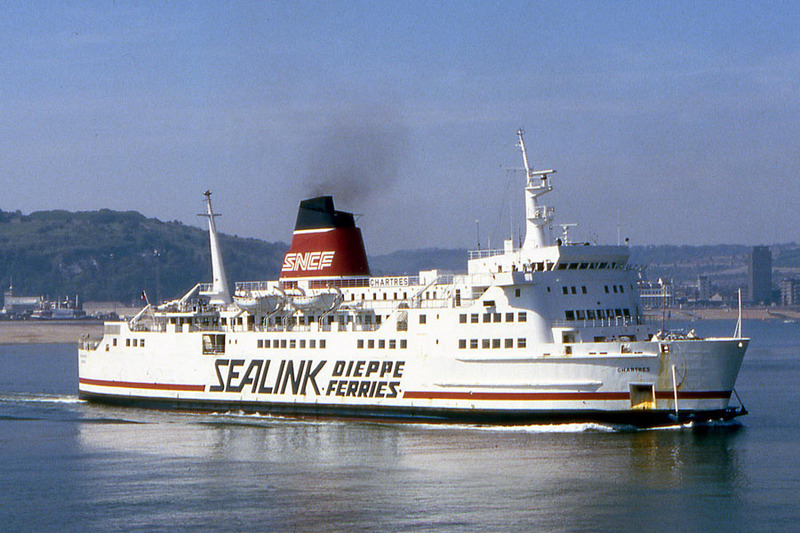 June 23rd 1990: Operated between Dover – Boulogne owing to a strike in Calais. 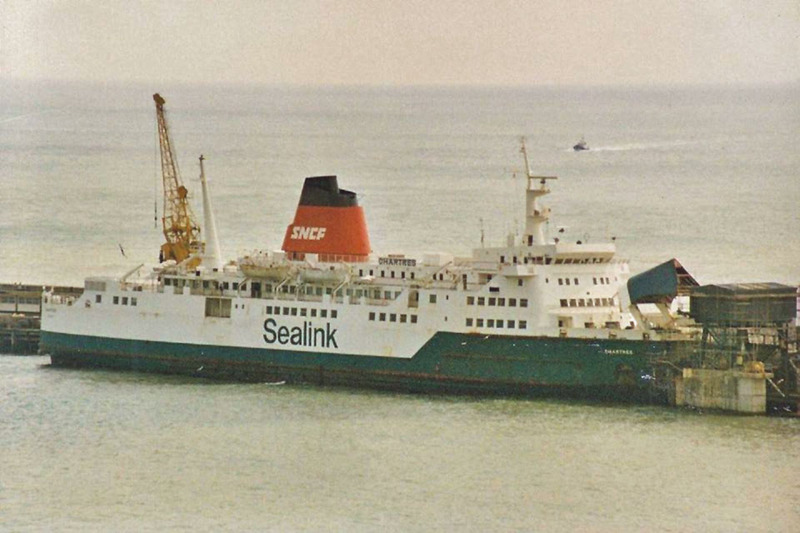 June 24th 1990 – June 30th 1990: Operated between Dover – Zeebrugge. 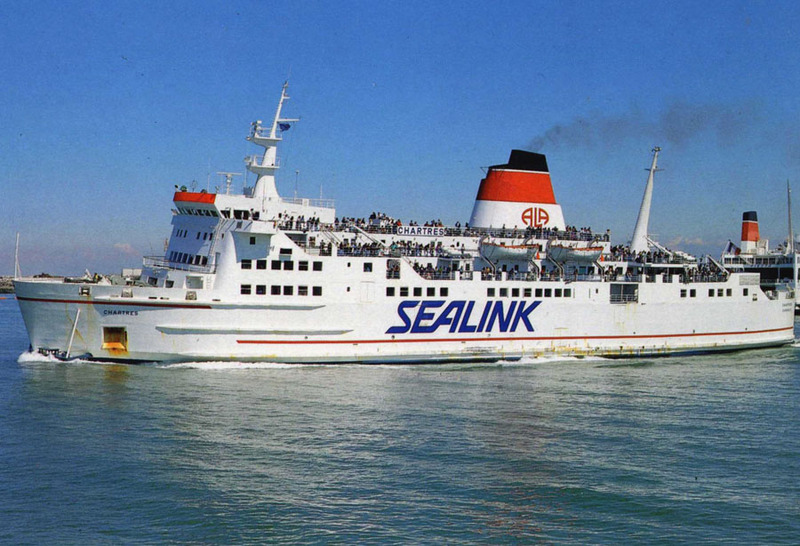 September 30th 1990 – October 14th 1990: Operated between Boulogne – Folkestone. 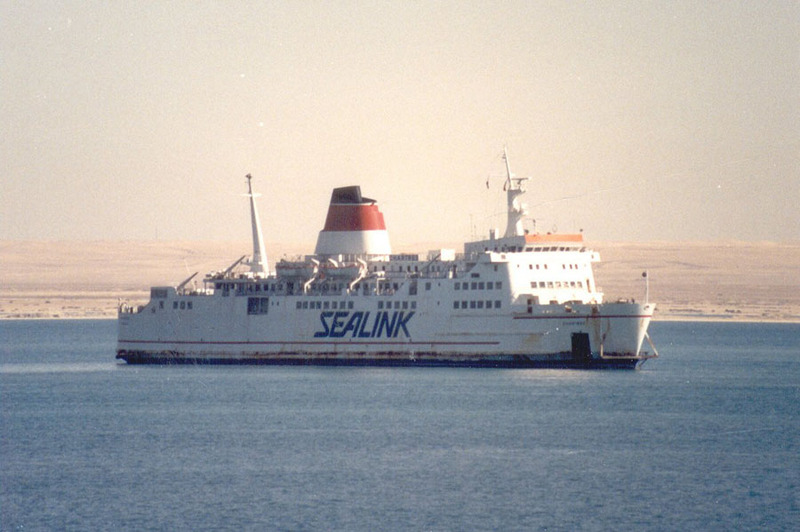 December 1990 – June 1991: Chartered to the French Government, operating between Toulon – Yanbu (Saudi Arabia), for the Gulf War. 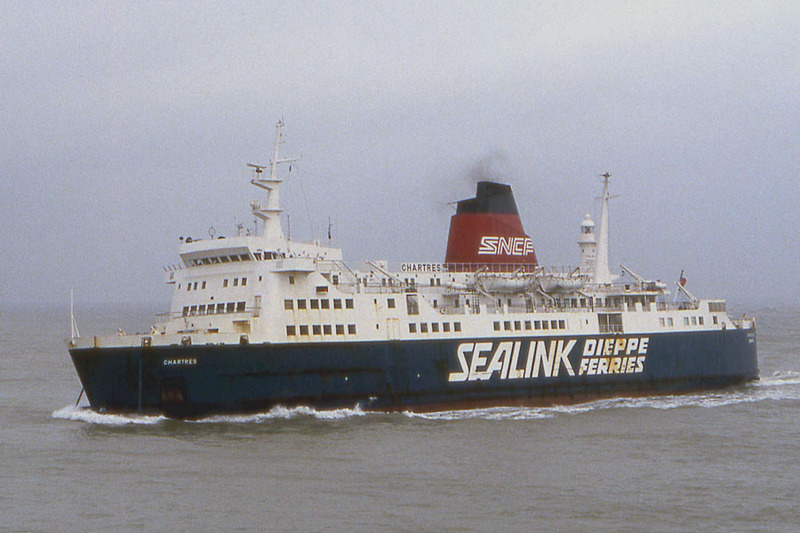 May 1993: Operated between Calais – Dover Western Docks. 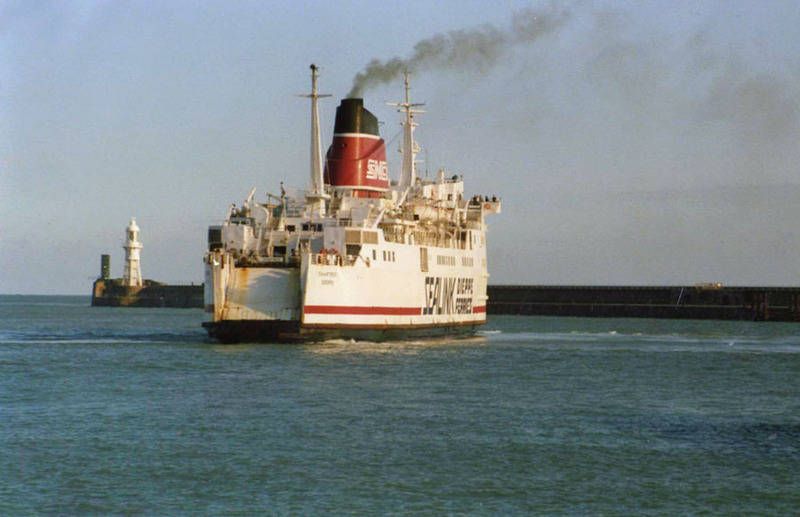 September 24th 1993: Final voyage between Calais – Dover Western Docks. 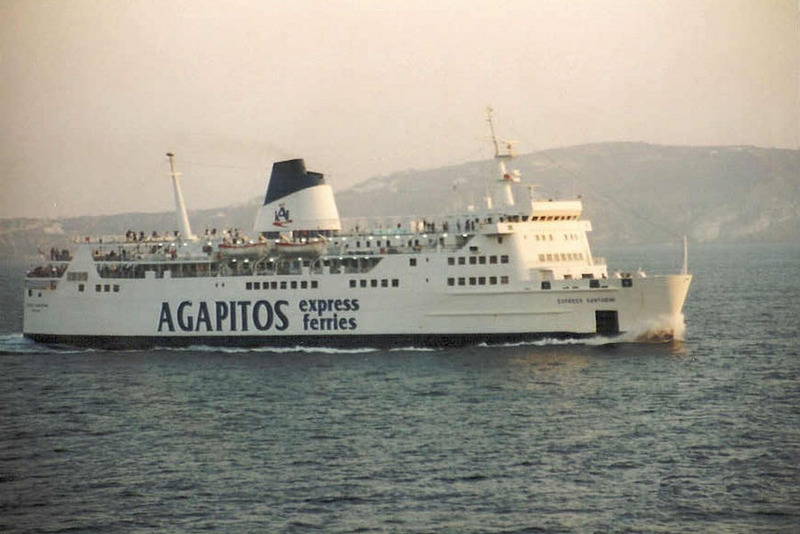 November 5th 1993: Sold to Agapitos Line, Piraeus, Greece, renamed EXPRESS SANTORINI. 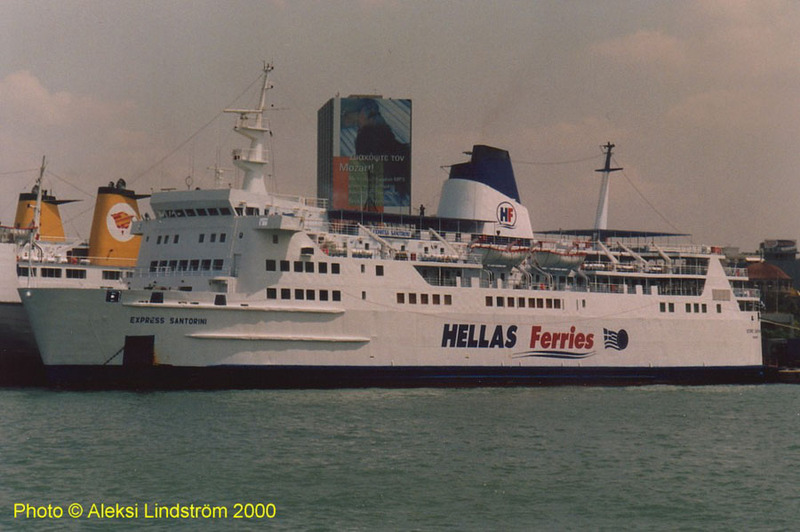 December 21st 1993: Left Calais for Piraeus. 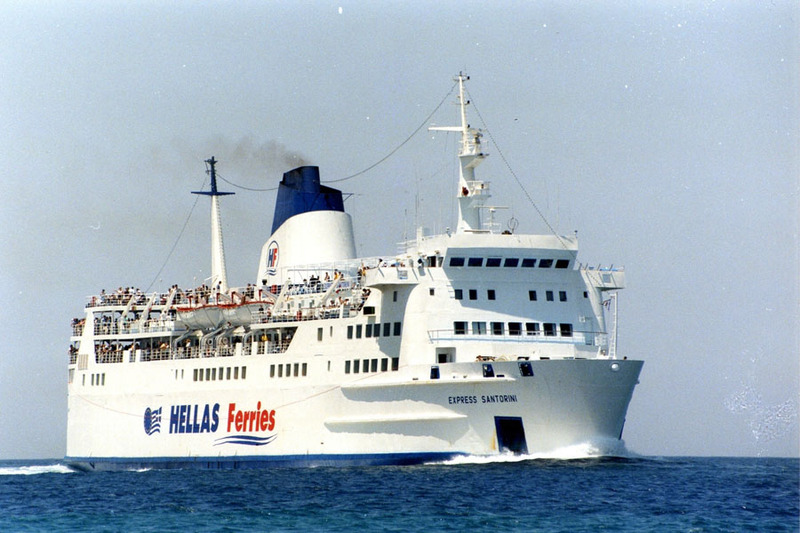 1994: Commenced service between Piraeus – Paros – Naxos – Santorini. 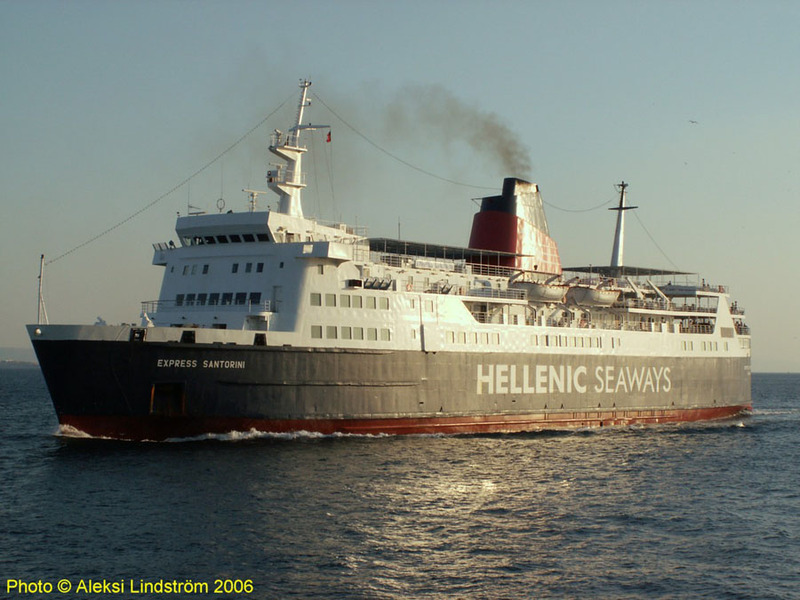 November 8th 1999: Sold to Minoan Flying Dolphin, Piraeus, Greece. 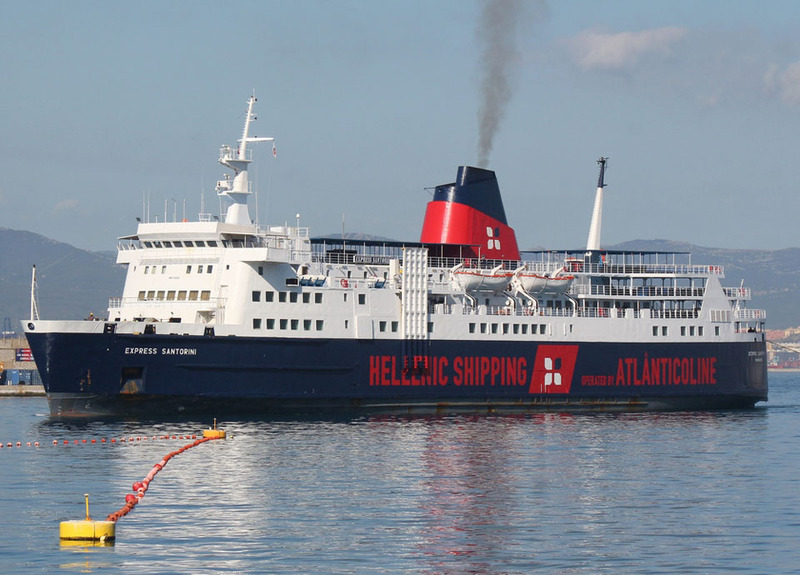 Introduced by into Hellas Ferries services. 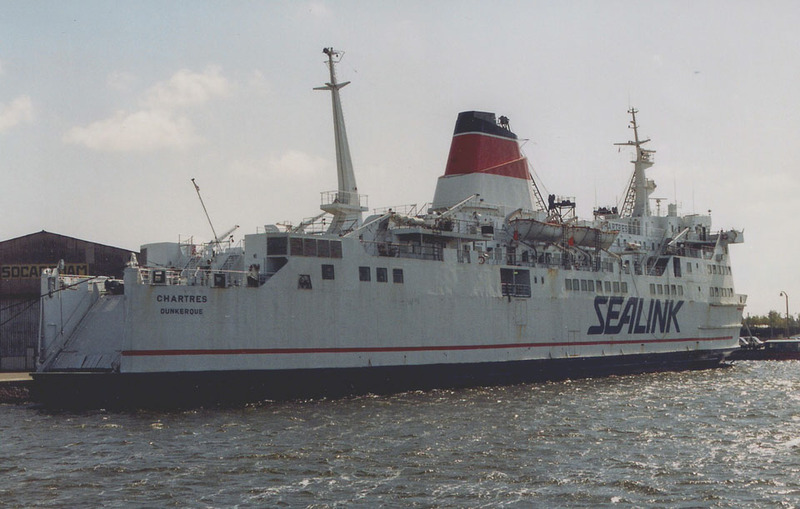 July 2006 (late): Withdrawn from service owing to a damaged crankshaft and it is currently not known if she will be repaired. 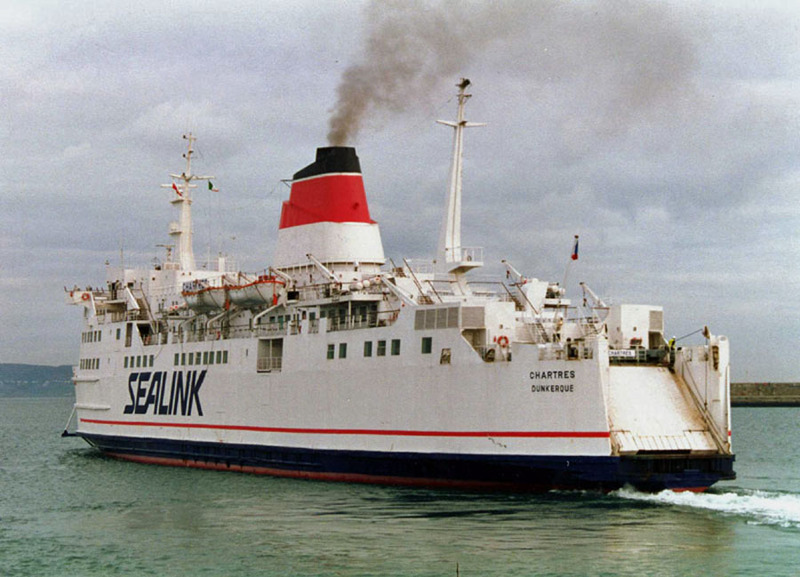 Her place was taken by the re-activated EXPRESS APHRODITE (ex ST COLUMBA). 2007: Chartered to Atlanticoline. Modifications included ramp on port side for required access to car deck. 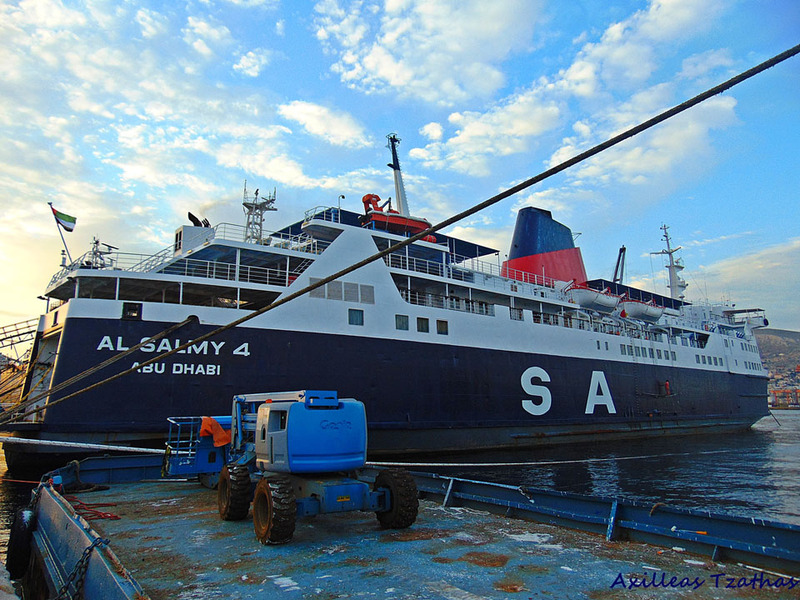 June 18th 2007: To be introduced between Faial – Pico – Sao Jorge. October 4th 2007: Bunkered in Gibraltar. October 8th 2007: Arrived Drapetsona and then laid-up. May 15th 2008: Left Drapetsona for the Azores. May 17th 2008: Bunkers taken on in Gibraltar. 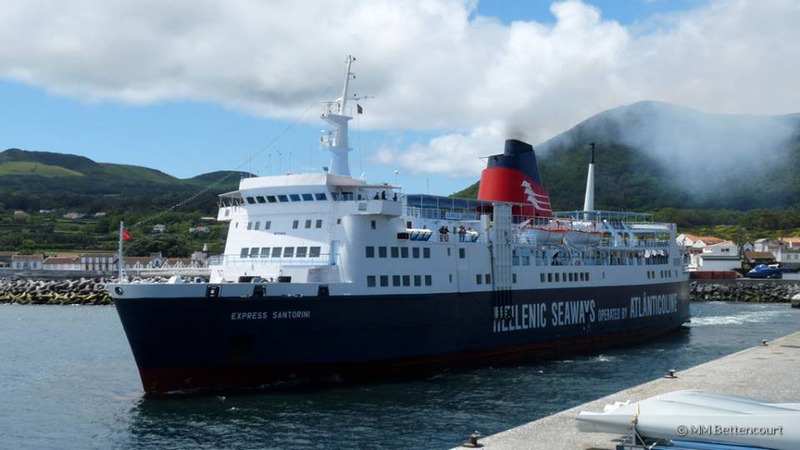 June 2008: Chartered to Atlantic Oline, Azores. 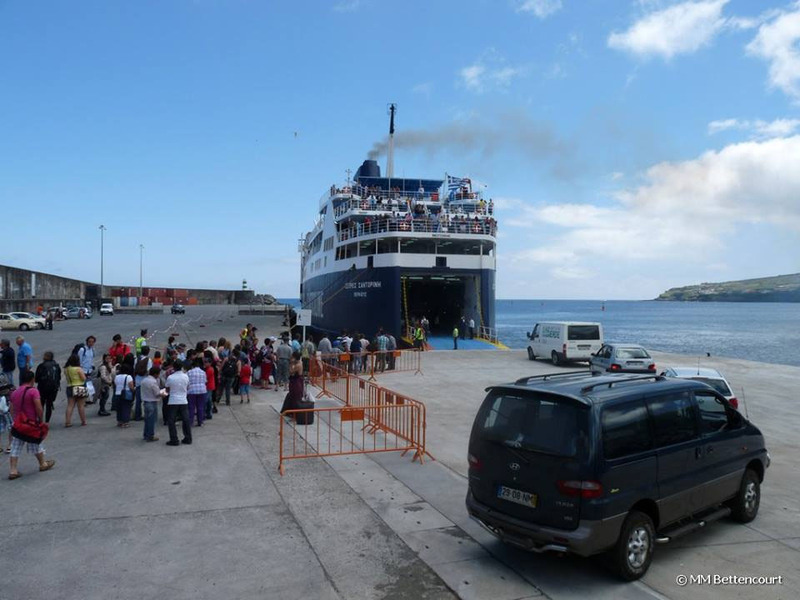 June 16th 2008 – October 2008: Service between the islands of the Azores. 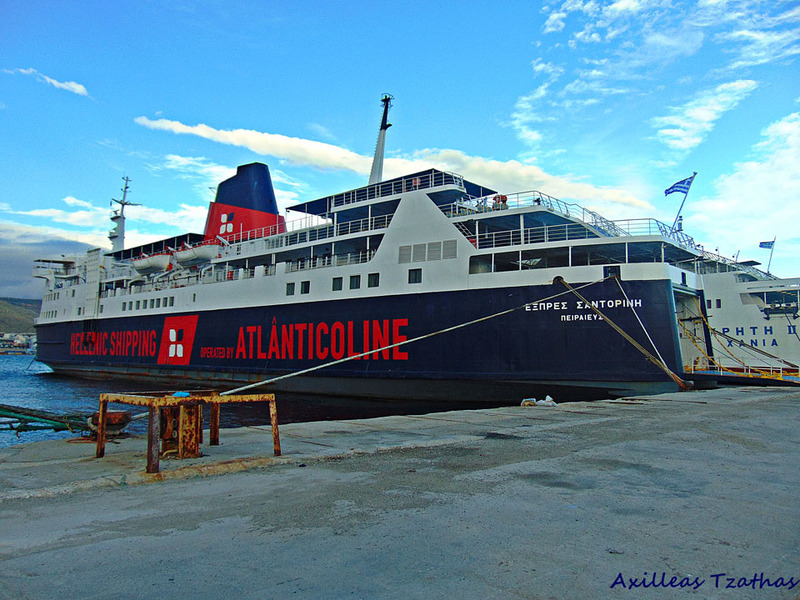 May 2009 – October 2009: Chartered to Atlantic Oline, Azores. 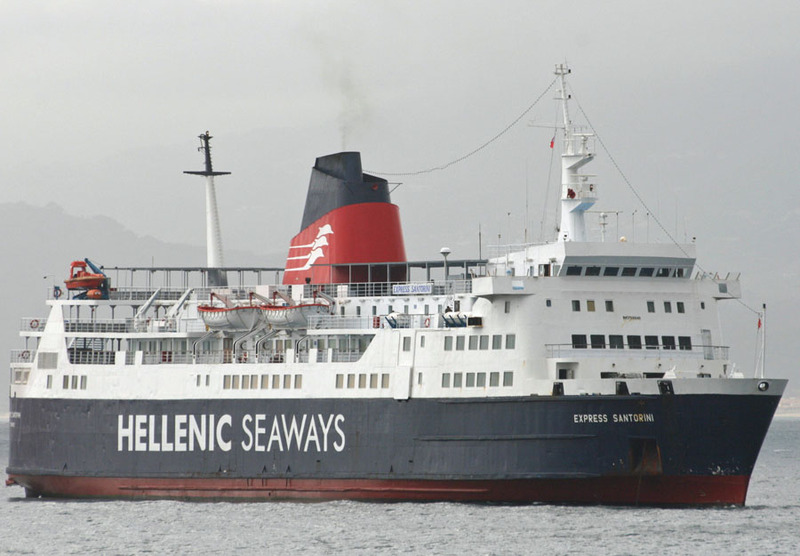 May 3rd 2010 – October 15th 2010: Chartered to Atlantic Oline, Azores. 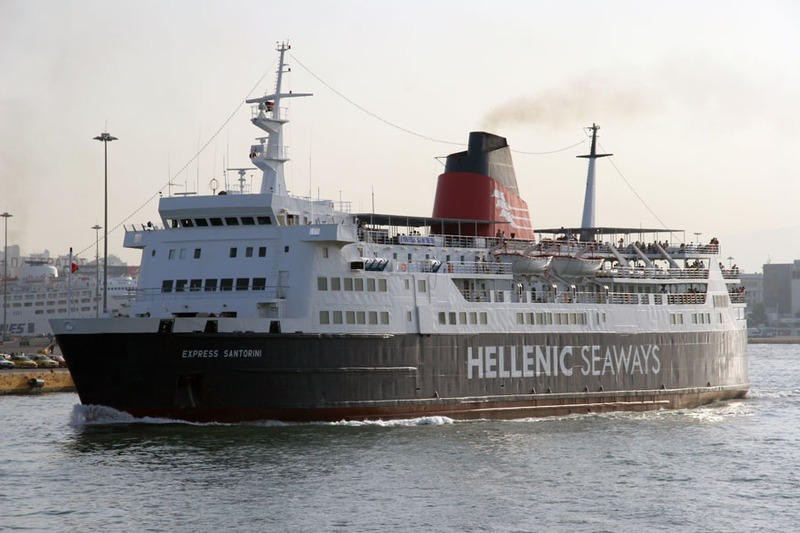 October 16th 2010: Refuelled in Gibraltar on her way to Greece. 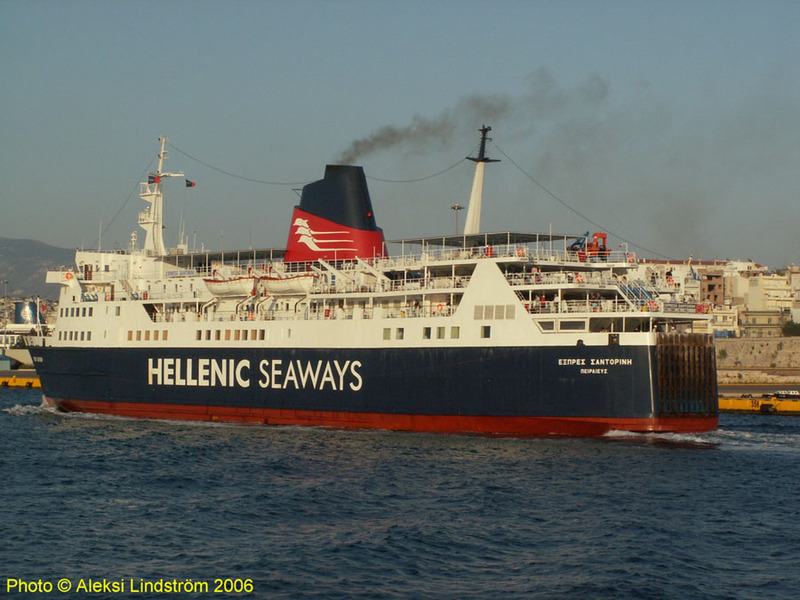 July 4th 2014: In the middle of her charter to Atlanticoline, was sold from Hellenic Seaways to Portucalance Shipping Co SA, Funchal, Madeira. Working in Portugal. 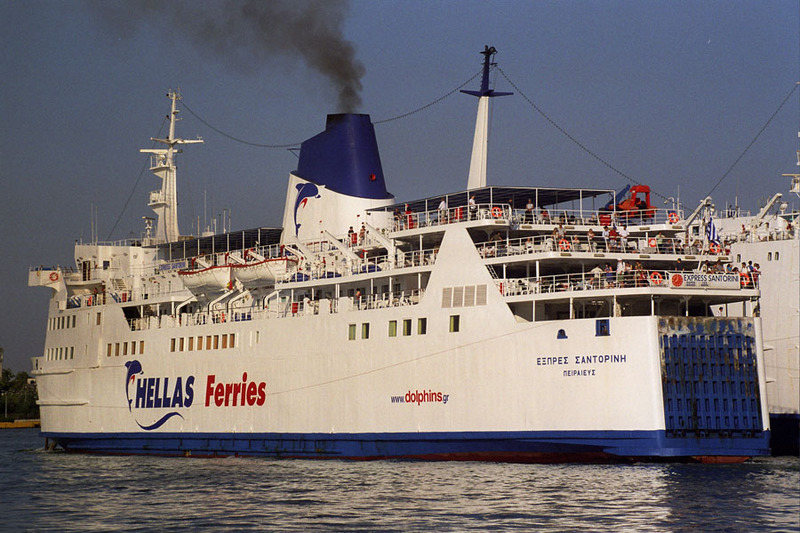 Back in Greece after the charter. 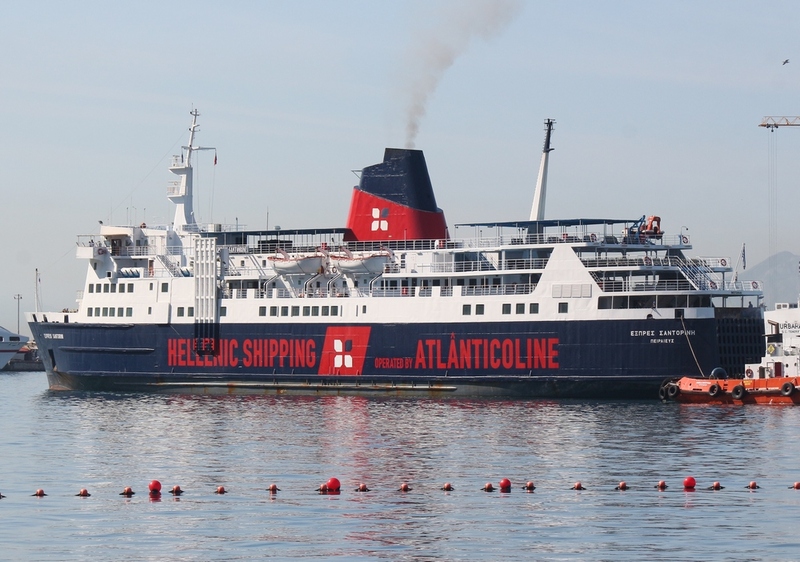 May 7th 2015 – September 2th 2015: Charter to Atlânticoline for summer service, then back to Greece. April 7th 2016: Sailed to Lisbon. New livery added. 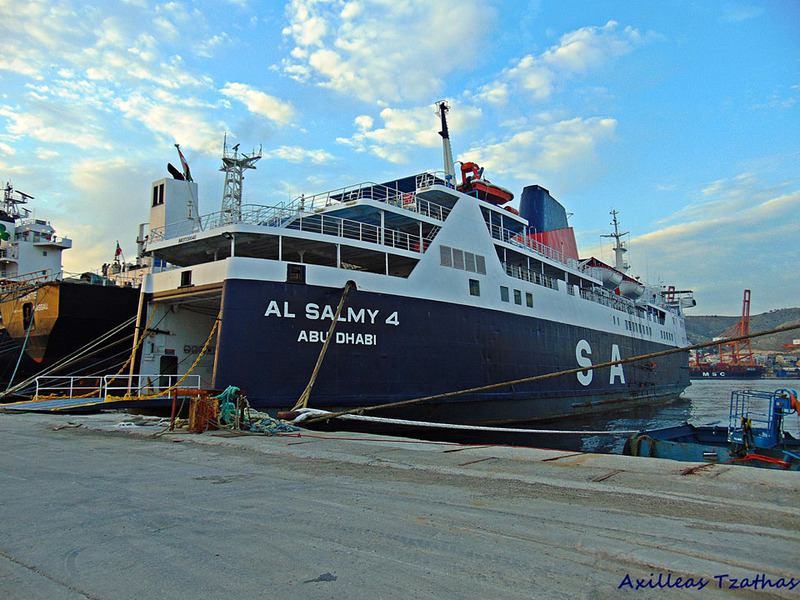 November 20th 2016: At Drapetsona Bay, Piraeus noted as having been renamed AL SALMY 4 (believed now owned by Salem Al Makrani Cargo Co (SAMC). All information is believed to be correct and no responsibility is accepted for any errors or omissions. All items included in this article are subject to © copyright. We would like to take this opportunity of thanking: Rik Arnoudt, Gary Davies (Maritime Photographic), Vicky Delaney c/o Our Newhaven, Benoit Donne, Daniel Ferro, Brian Fisher, Ton Grootenboer, Frank Heine, John Hendy, Pieter Inpyn, A G Jones, Ken Larwood, Aleksi Lindström, Peter Longhurst, Carlo Martinelli, Justin Merrigan, Manuel Bettencourt (Porto da Graciosa), Sealink Heritage UK, Axilleas Tzathas, Sybille Weber and Andreas Wörteler for their assistance in producing this feature. 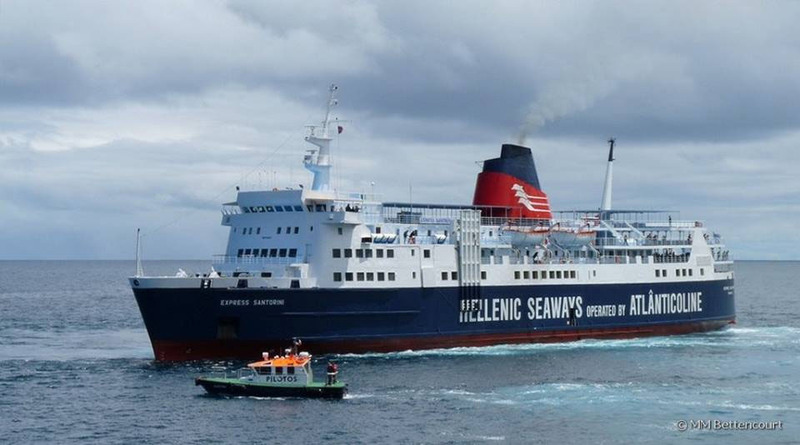 Currently on weekly services in the Azores having overwintered in Pireas – some delivery voyage from there to Lisbon, I wonder what that cost in fuel. 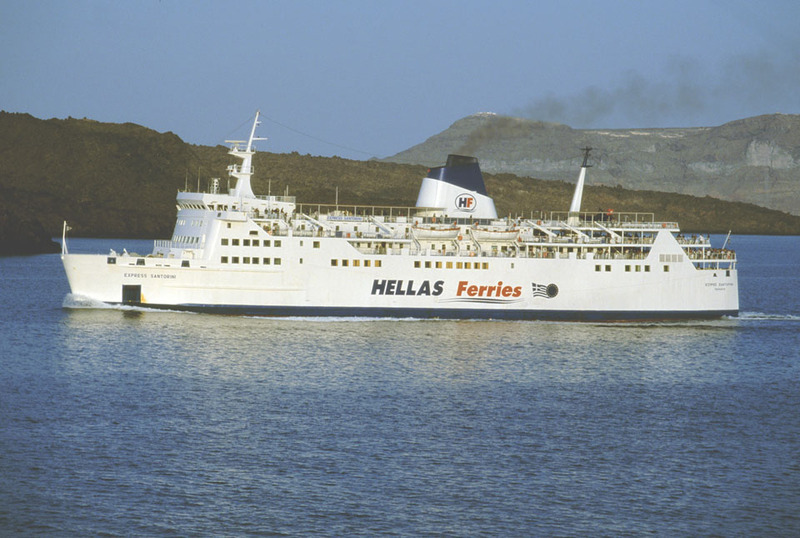 Is a plaser to visit this great page about ex-Chartres, Express Santorini (now). 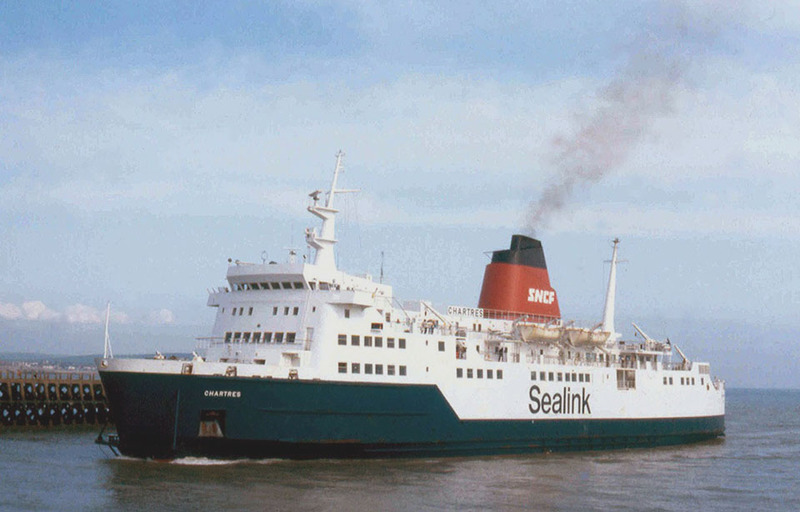 This page contains important information about this ferry. If you need more pictures please say! 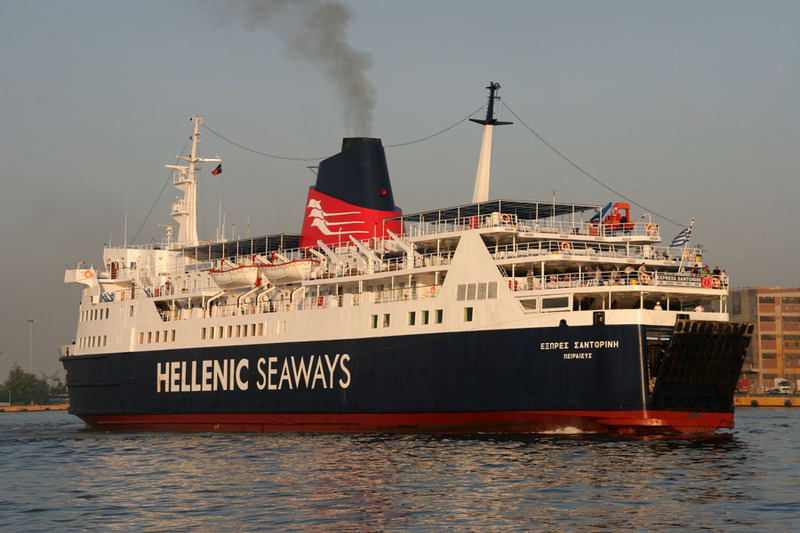 On behalf of myself and Mr Thornton thank you very much for your kind words, they are greatly appreciated and a big thank you for the photographs of the Express Santorini. 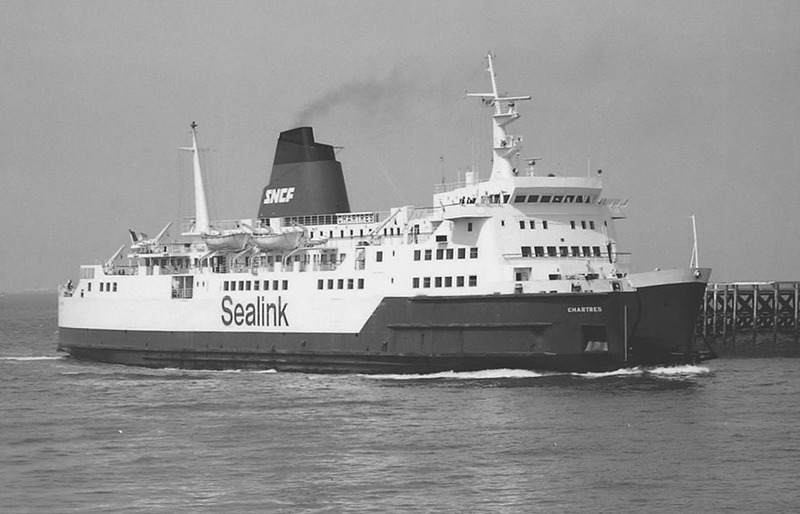 One thing which hardly ever gets a mention is that on one occasion, in the late 1970’s I think and during a French fishermen’s strike, the Chartres, along with the Compiegne and Chantilly, actually transferred to running Dover -Oostende for several days alongside BR Sealink and RTM Belgian vessels. (All TTCF also ran to/from Dover/Zeebrugge). 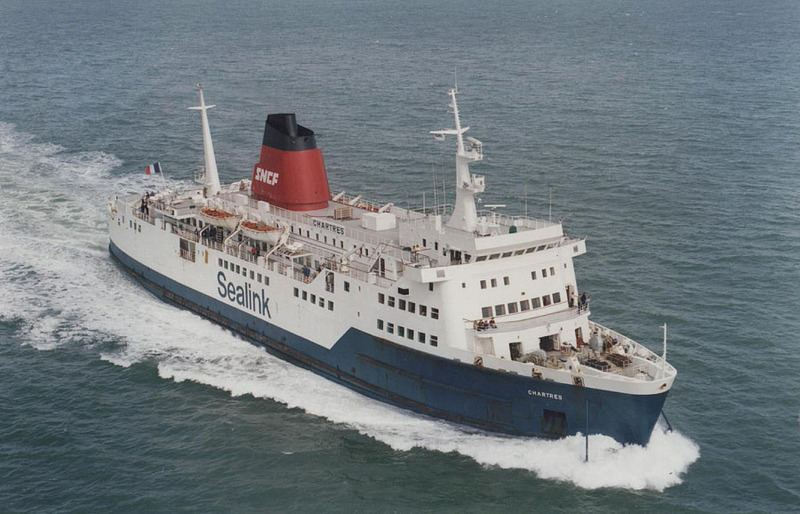 I know this as a former ferry worker- shore staff- I recall I had to reply to request from Berthing Master, Oostende, for the French vessels size and capacity information just before they transferred to the route.